The Best-Selling Author Discusses the Opening of Inn BoonsBoro and Her Business Outlook. Hagerstown magazine: It’s amazing that you bounced back so quickly after the fire. How did you do it? Nora Roberts: By having the miracle worker of a job boss and the most amazing crew ever. These guys are dedicated, they’re invested, they’re so skilled, and they really made it happen. HM: And they’re all local? NR: All local, and the subcontractors, they’re all local. We try to use local whatever, wherever. So the carpenters, the painters, the tile –– amazing. The HVAC unit, all the heating and all the big boilers –– stuff I don’t even want to know about! The roofers, the electricians, all of them local. HM: You mentioned in the Smart Company magazine story the importance of symbiotic relationships within the community. How have these relationships helped Inn BoonsBoro to open? NR: Oh my god, Bast Furniture –– I have to mention them first because they are my heroes. When we had the fire, a lot of the furniture was already in. They stored everything for me for nothing. Plus, these last two and a half weeks, when we started loading in, I guess it’s been that long, I would find things that didn’t fit or I’d need something, I would be running down there like twice a day, every day. And they would find a piece, send it up. They would tell me if it doesn’t work, just call us, we’ll come switch it out. They have saved my life countless times over these past couple of weeks. So Gifts Inn BoonsBoro, across the street, of course it’s my store, still I’m running around, “Oh I need this, oh there it is, yea that would work!” And same with my husband’s bookstore. “I know you’ve got that little thing in there…” and I’d stick it in my pocket. My son, you know, sent over French fries one day, you know “Have you eaten?” That kind of thing. And I think the investment and the interest of the other local businesses and the townspeople, their enthusiasm, it just helps morale when you’re coming back from something like that, and you’re finally seeing the light at the end of the tunnel, but there’s still so much to do. Everyone’s “oh it looks so beautiful,” it really helps to hear that, “oh it just looks beautiful,” you know, the porch when they could take the tarp off. So you know, it pumps you up. You work harder to get it done. 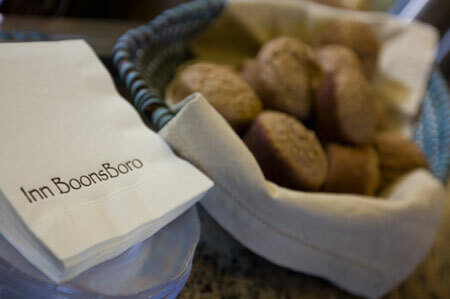 HM: What lessons has the Inn BoonsBoro taught you as a business person? NR: That I’m not. I’m a writer who wants to write, and I can’t wait to be done with it. Yeah, I mean I do not regret the experience at all, it’s been fascinating and rewarding and satisfying, but I really just want to get back to my keyboard. For me, these past two weeks have been a huge break from writing, and I need to get back to work. Plus, I have to put on real clothes every day, add some make up, come into town here and deal with decisions and, “what do we do about that” “what do we need that” and “move this here” all of that, and it’s cold, it’s really cold! It’s wintertime, I’m supposed to be in my pajamas, or flannel pants, sitting in front of my keyboard. Other people have to go out to work, I just have to go upstairs to work. So I’m really ready to go back to that. HM: What impact do you think the Inn will have on the local economy? NR: I really, really hope that it helps. It was one of the reasons for the project to begin with, not only to bring this incredibly beautiful building back, but to help make, we hope, Boonsboro a destination. There’s no place to stay in Boonsboro; now there is. So people come here to stay, that’s revenue for the town. But, there’s a restaurant across the square, my son’s, there’s a restaurant next door here, there’s Crawford’s across the street. Eat there. There’s my husband’s bookstore, there’s a little candle shop up here, there’s Gifts Inn BoonsBoro, there’s Bast Furniture, there’s the Green Bamboo Day Spa, there’s all of these things ­­–– use them. Spend money in Boonsboro. Come and see the town, walk around. It’s a friendly town. It’s really pretty. Spend money here, because we’ve got some great stuff. Look at the art, that’s all from local artists. HM: And all of the art in the Inn is available for purchase? NR: It’s all for sale here and Gifts Inn BoonsBoro, that’s all local arts and crafts in there. But yes, all the art in the Inn except a couple pieces that were my mother’s. But everything else is for sale. If a guest falls in love with one of these, we’ll have all the information for them. And they can take home a really nice souvenir in a painting or photograph. HM: What will be your involvement with the Inn? NR: Suzanne [McErlain, the innkeeper] is in charge. If she has a question or she wants to make a change, she would of course run it by me. But I’m not going to be in here seeing what’s going on. I will certainly visit when I’m in town. You know, like I go to the doctor or the dentist, I have to go right through Boonsboro, I always stop in my husband’s bookstore, and I’ll come over and see Suzanne, because, I like her, see how the place is doing. But I have nothing to do with the day-to-day running of it. We’ve set it up, and I think we need to be fluid for the first little while because you’re not sure how things are going to go and what you might need and where you might want to adjust. But I’ve got an innkeeper who thinks really well on her feet and is very calm, which I think is important too, and handles crises very well. If she needs something she knows she can either call Bruce or e-mail me or call me after four unless it’s an emergency, just like I tell my children. HM: What are your business strategies for success in such a turbulent market? NR: I think you just offer a really good product and really, really good personal service. And have patience. Because a new business like this, a new place like this, isn’t just going to be a success from the first moment. It’s a success because the building stands, and is rehabbed and has come to life again. So now the financial and monetary success — business success — that might take a while. But we’re patient. 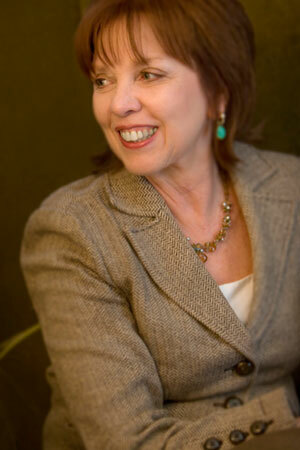 HM: What can we expect this year from Nora Roberts, the author? NR: Actually J.D. Robb has a new book coming out in about a week from Putnam, and I have a quartet, in trade paperback coming out this year. It’s a wedding business, four women who run a wedding business. We have the photographer, the florist, the dessert chef and the wedding planner, and the first one comes out in May. My Roberts hardcover this year is Black Hills, set in the Black Hills of South Dakota coincidentally enough, and deals with a wildlife refuge, and murder and mystery. HM: As a successful entrepreneur, what advice do you have for local business owners? NR: Well I think it’s so important to love what you do, and sometimes it can be very hard. And I’ve been lucky with that with my writing, and then to find someone like Suzanne, this is just really a dream to do what she’s going to do. That’s why I know she’s going to be brilliant at it. So, I guess it’s love what you do or try to find something that you love to do and you’ll have one leg up there anyway. You’ll be better at it.